In 1930, Olin L. Anglin started a family business known as O. L. Anglin and Sons. This family owned and operated foundation and masonry repair company offered superior masonry services for homes and businesses in Atlanta. His ambition was to offer the highest quality in constructing and repairing masonry footings, foundations, brick, block, stone, concrete, retaining wall reinforcement, and total foundation/wall stabilization. 87 years later, Anglin’s Foundation & Masonry Repairs is still keeping that mission up and running. Anglin’s Foundation & Masonry Repairs is a fourth-generation family business that has improved on the “family mission.” Our mission is to provide a permanent engineered and designed foundation solution through the development of innovative products and systems, installation and services at the very best price. John Anglin took over the growth of our customer base in 1960, and business has grown tremendously. We offer a lifetime of structural and masonry repair experience that is not after your money. All of our work is backed by our price protection: if you are quoted at a lower price by a qualified contractor within 30 days, we will match that price and add a 10% discount. We are not after your money! We are after providing you with a lifetime solution to protect your home and your family. All of our work is also backed by our personal guarantee: we have the solutions, expert experience, equipment, and proven value for your structural problem. We are here to help you – we guarantee it. Your home or your business property is a huge investment, and we do not take that lightly. Foundational repairs can be extremely costly, especially on older homes/buildings or when damage is not found until late in the game. 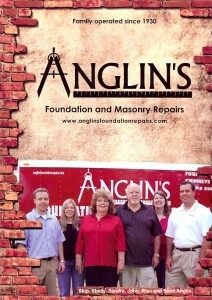 Anglin’s Foundation & Masonry Repairs is not a franchise. Our family tradition offers quality work and solutions to foundation problems at affordable prices because we value you and your property. Anglin’s Foundation & Masonry Repairs has 87 years of quality service under our belts, and we do not plan on putting that to rest any time soon. We can provide you with an extensive list of references and partners including architects, homeowners, realtors, investors, engineers, builders, and remodeling contractors. We run the gamut, and we do not let our customers down.